Want this product the sooner the better? Order it now and you'll receive it within 2-3 days within UK. See delivery terms & fees. Can be cut every 10cm. Do you require any cuts/joins? Bring any room to life with the Mirrorstone 7.2w/m RGB LED strip light, perfect for use in parties and other social gatherings as well as being usable in day to day life. Not only this but these strips are also applicable in a range of commercial uses as well as being highly usable in design projects. The colour changing strip lights comes with a self adhesive backing so they can be stuck down onto almost any surface and be mounted in nearly any location. Due to the wide range of surfaces that the LED Strip Lights are stuck to, we unfortunately cannot guarantee the adhesive on all surfaces. These strips can also be cut to the nearest 100mm so you can get accurate measurements for your installation. The RGB LED strip lights are also applicable to the wide range of discount codes that are on offer. You can save up to 20% on your LED strips making a great saving before you even install them. The brand new Spectric line of LED strip lights will massively improve your lighting experience. These strip lights bring more vivid lighting, with a greater lumens to energy expenditure ratio than ever before. The life expectancy has been increased, with a whopping 50,000 hours of usage delivering a versatile light every single time. As strip lights are a very versatile product and has a use both internally and externally, it is available in a full range of waterproofing options. These waterproofing options and where the installation of them is listed in the table below. Being non waterproof, any IP20 rated strip is installed internally. Due to it not being waterproofed, it is available in 10m rolls. IP65 LED strips have a thin layer of silicone coating on them to protect them from splashes and jets of water. They are normally installed internally in bathrooms or externally where water doesn't sit or struggles to get to it. Due to its silicone coating, the IP65 is available in rolls of up to 5m. Being fully submersible, the IP68 strip lights can be installed anywhere up to 10 metres in depth. IP68 strip lights are fully covered in silicone and come in rolls of up to 5 metres. IP68 Nano strip lights are exactly the same as IP68 strip lights in their waterproofing qualities. Rather than being encased in silicone, they have a layer of hydrophobic silicone making them a lot easier to work with and available in lengths of up to 10 metres. Like previously mentioned, this LED strip light can be cut at every 100mm interval. In light of this, we offer a 3 for free cutting and soldering service to get your strips pre-cut ready for installation. Our full range of LED strip lights are included in this service. As well as custom lengths of strip light, we can also extend the tail on the end of the strip out for you with RGB LED cable. This service is only available to LED strips purchased at Wholesale LED Lights. 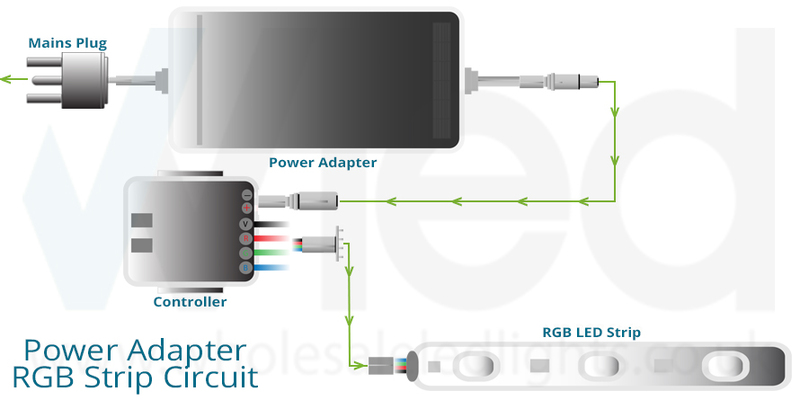 Like its single colour counterpart, you can run up to 12m in the 7.2w/m RGB Strips or 10m in one uninterrupted length. All LED Tape is priced per metre. If you purchase any amount of LED strip lights then we will send it out as one full, uninterrupted length e.g. 1 x 3m rather than 3 x 1m. The RGB LED strip lights are 12 volts and come with individual RGB LEDs. Being low voltage, you will require a 12 volt power supply for the strips to make them function. RGB LEDs can mix different amounts of Red, Green and Blue so you can achieve a wide range of colours and effects including cool white. You will also need a low voltage controller to change the colour of the strip lights. Without installing a controller for the RGB LED strip lights, it is impossible to change these colours and it will default to white. Getting 12 volt power to the strip lights is a very easy job as we have a range of power supplies that include AC/DC power adapters and waterproof LED drivers. We have a range of controllers available for changing the Colour ranging from IR (InfraRed) to RF (Radio Frequency) for domestic installations as well zonal controllers and a DMX system for large, commercial installations. These controllers can obviously dictate the option of changing the colour of the strips, they can also change the mode, speed of the set mode and brightness of the static colours. Despite the strip lights being dimmable, you mustn't purchase any style of dimmable LED driver for use with the strips as the controllers dim them. Buying a dimmable driver will cause the controller not to function but this is easily resolved by just changing over to a standard LED driver. Our power supplies all have varying power outputs on them to accommodate for a wide range of strips. Our controllers also all have maximum loads, varying form 72 watts up to 288 watts so please factor this in before choosing your controller. Below is the wattage for notable lengths of the 7.2w/m RGB LED Strip Lights. ■ 30 Metres - 216 Watts. When powering the RGB LED strip lights, it is advised that you run about 10% under the maximum load of your power supply so it runs at a cooler temperature, maximises the lifespan and runs more efficiently. Our full range of LED tape comes with a life expectancy of up to 50,000. This lifespan means the strip lights will last up to 15 years. This lifespan can fluctuate depending on the conditions where the strip lights have been installed. The table below has all the conditions that can affect the life of such products. The temperature surrounding the LED strip is cool. Warm air around the LED strip can cause premature failure of the LED strip. IP Ratings are only used when absolutely necessary. Using IP Ratings when not needed. The silicone casing holds heat in and causes the LEDs to overheat. The material that the LED strip lights are mounted on dissipate effectively (e.g. aluminium). If the material that the strip is mounted on isn't good at dissipating heat it can drastically reduce the life (e.g. wood). You are looking at around an extra 50% lifespan on your LED strips if all favourable conditions are met. This can make the strip last up to 75,000 hours. To help you with the extension of the life, we sell profiles made of aluminium that can dissipate heat very effectively and increasing the lifespan, like previously mentioned. Not only do these profiles add to the life of the strip, but with the option of a clear or frosted diffuser, they can add the complete finish to your strip light installation. If IP65 LED strip light are mounted onto a surface without aluminium profiles, they are not covered by the 2 year warranty. Replacements for any IP65 strip lights that have failed without aluminium profiles within the first 2 year will be charged at 50% of the retail price when bought with aluminium profiles. Our full Mirrorstone range of LEDs and related products come with a 2 year warranty as standard. Beyond this, you can also upgrade this warranty on all LED spotlights, LED light bulbs and LED tape products to 5 years, free of charge. This application for this extension can only be requested and applied within the first 90 days of purchase. If you want to cut your LED strip lights on site or have an issue with mounting then refer to the 'How to' guides on our YouTube Channel. If you purchase any amount of LED strip lights then we will send it out as one full, uninterrupted length e.g. 1 x 4m rather than 4 x 1m. If you have any questions about our range of controllers, the 5 year warranty, trade enquires & wholesale rates or anything else then please do not hesitate to get in contact by phone on 0116 321 4120 or by e-mail on cs@wled.co.uk. Quick delivery. Fitted, working fine. Nice product. The colours are vibrant and pleasing to the eye. Great product plan to do an other room thank you for your help cheers!! Incredible strip light!! George was a great help when putting it through. The whole team were a great help with any queries as well! Great product, very helpful company, I made a mistake on my order wrong plugs but they checked with me to confirm the order excellent service! light sticks well, v. bright and will recommend.